I'd always told myself that there was plenty of time to goof around later, after I'd gotten into Standford. But if the past month had taught me anything, it was that the life you plan isn't the life that happens to you. And I was beginning to realize that there was only so long where a trip to Starbucks could be illicit, where there was a campus to sneak away from, and rules to break. I don't know why I did it, but I imagined us at a real movie theater, splitting an overpriced popcorn, our fingers getting tangled as we scooped the last kernels from the bottom. And it was a real date, the kind where he picked me up in his car and we ran into people we knew fro school. Except his town was hours away from mine, and I didn't know if he had a car, and we didn't go to the same school, and those weren't even the reasons it wouldn't work. It was just a fantasy. Just a scene in my head of a date I'd never have with a boy who hadn't asked me. "Here's a secret," I said. "There's a difference between being dead and dying. We're all dying. Some of us die for ninety years, and some of us die for nineteen. But each morning everyone on this planet wakes up one day closer to their death. Everyone. So living and dying are actually different words for the same thing, if you think about it." But the truth was, most of us weren't in high school yearbooks. We were the ones who'd faded away, who hadn't come back in the fall. Who might never come back. Because TB wasn't like cancer, something to be battled while friends and family sat by your bedside, saying how brave you were. No one held our hands; they held their breath. We were sent away to places like Latham to protect everyone else, because it was better for them. One thing I realized about new places is that they're like jeans. Sure, they might fit, but they're not comfortable. They need time to be broken in. 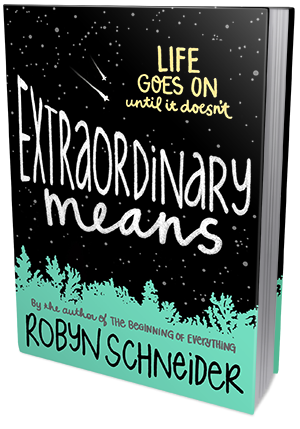 Extraordinary Means is, basically, like Thomas Mann's The Magic Mountain for the YA crowd. I have read Mann's behemoth of a book while studying literature (few years ago, different continent, whole different life), and it's one of the books that imprinted itself on my memory. I still remember the vividly described, enchanting setting and intelligent, sharp, insightful prose. (Really, you should read The Magic Mountain if you get a chance, it's a work of utter brilliance and erudition). That being said, if you like contemporary books that are quietly powerful, predictably heartbreaking, thoroughly unsettling, thought-provoking, memorable and filled with existential themes, you should definitely read Extraordinary Means, too. Just like TMM, it's a book destined to become a classic. From the moment I started reading Extraordinary Means, I kept thinking about The Magic Mountain and how much the atmosphere of Schneider's book reminded me of Mann's story. The similarities in the plot line itself aren't all that many (the tuberculosis, the isolated setting of sanatorium, etc), but they're clear and it's hard not to notice them. Lane, Sadie, Marina, Nick and Charlie are all sick with a drug resistant, incurable strain of TB. Latham House, part sanatorium part boarding school, is their new world. They live there, they sleep and eat and go to classes there, and they wait to either get better and be sent back home, or, well, get worse and probably die. When Lane arrives at Latham, Sadie and her friends have been there for a while now. They're close-nit friends, the cool kids, the laugh-too-loud and refuse-to-follow-rules kind of kids. Lane knows he wants to be part of their group. But though Sadie and Lane know each other from a summer camp many yeas ago, they're not exactly good pals. Lane remembers Sadie as the shy and quiet wallflower girl, always taking pictures with her camera. Sadie remembers Lane as the one who stood her up, broke her heart, and scarred her for life. Is their running into each other a second chance at making things right, or is it yet another nail in the coffin of their incredibly depressing, hopeless lives? Extraordinary Means is quite a profound and stimulating read. It's a slow moving, darkly funny, beautifully tragic and very smart kind of book. I loved the characters, the relationships, the interactions, dialogues, friendly banters and the almost excruciatingly shy romance between Sadie and Lane. Everything seemed authentic, real, convincing. The characters and their emotions, their worries, regrets, needs, hopes, reactions.. All of it really spoke to me and I was sucked into their world almost instantly. Both Lane and Sadie are complex characters. They're almost polar opposites of each other, but their attraction to one another is undeniable. The chemistry between these two was phenomenal. And it didn't feel forced, or rushed. It was.. really quite awesome. At the same time, this is not just some tragic love story. It's so much more than that. Honestly, the romance part is maybe 35% of the whole thing. This book is mostly about living and dying, being diagnosed with a life-changing disease and having to face all that comes with it, staying strong despite feeling utterly hopeless, finding something worth holding on to, something worth living for. It's about being uprooted and isolated, lost, scared, confused, sad. It's about all the things that matter in life. And in death. It's just.. beautiful. I took my time reading this book. It demanded my undivided attention. I kept re-reading some of the more insightful and thought-provoking passages ("Latham was my Hogwarts, and protocillin was the cure for my magic"). I savored the lyrical prose. I laughed at all the clever inside jokes, I hoped and I mourned. Extraordinary Means is the kind of contemporary fiction that you can not only easily connect with, but you can also benefit from it on many levels. It's intelligent. It's emotionally affecting. It's, to some extent, cathartic. It makes you think about certain themes and issues, and then ask yourself questions like: "What would I do in a situation like that? ", "How would my life change if I was the one infected with a drug resistant strain of TB? ", "How would it affect my family?" etc.. I know this book will stay with me for a long time. I am so glad I picked it up!